Estate planning is a complex process that requires effort and control to ensure an optimal outcome for the succession of your estate and the financial security of your loved ones. Coloradans with estates of all sizes can benefit strategizing their assets to go the furthest into retirement and beyond. If you are currently not in possession of a cohesive plan for your future, the estate planning attorneys at Peek Goldstone, LLC are here and ready to help. Our experienced law firm helps Greeley residents with a wide range of needs, from family law and adoption to traffic offenses and more. We rely on a diverse team and excellent communication to ensure that all of our clients receive the most comprehensive support. Our estate lawyers are happy to help citizens from all walks of life in creating a personalized approach that plans for the best while preparing for the worst. While we can spend days explaining the intricacies and benefits of professional estate planning, today’s blog post will narrow it down to five advantages you can benefit from. If you do not have an estate plan, be sure to reach out to the Peek Goldstone, LLC team for top-notch assistance! Revocable living trusts. Giving your assets to an entity can shield you from certain tax responsibilities. This strategy also allows you to effectively manage your estate. Charitable donations. Instead of paying high taxes, you can donate money to a charitable cause to help every party involved win. Valuation discounts. Assets that are hard to value can qualify for discounts. In most cases, property is assessed for its fair market value when transferred. Limited liability companies (LLCs). Similar to a trust, a family LLC can give you the ability to avoid personal tax liabilities while keeping your close family in the business for easier transfers and less penalties. Tax-free gifting. The amount that you can give any individual per calendar year has been increased to $15,000, meaning you can gift that amount to each family member for tax-free estate reductions. There are many more strategies that can prove even more effective in keeping your estate intact. When executed properly, these cohesive plans can provide numerous benefits to your estate. 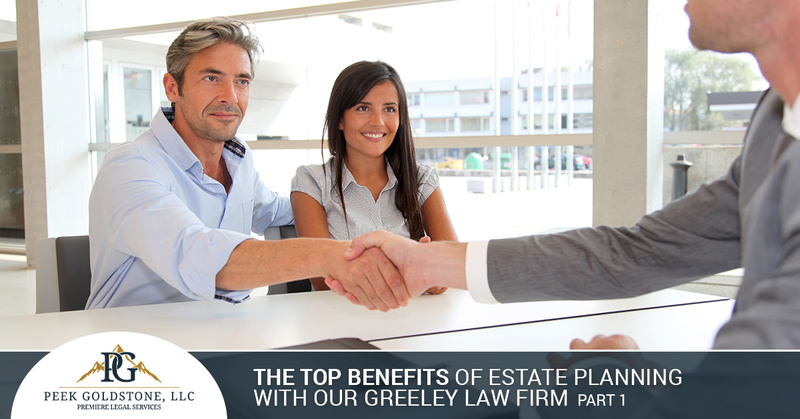 Our Greeley estate lawyers are here to help empower you in planning for an optimal result. One evolving part of estate planning centers around protecting an individual’s assets from unforeseen burdens such as creditors or lawsuits. While this may not seem relevant to your estate, keep in mind that creditors can come in all varieties and in many cases are not expected. In 20 years, you may have a different strategy for protecting your assets, but plans are needed just as much today. Modern estate law is more complex than ever, incorporating a wide range of considerations and possible scenarios to ensure that your loved ones and your assets are protected no matter what happens. Next time, we’ll continue this subject by highlighting a few more benefits you can expect from working with our experienced estate planning attorneys. Peek Goldstone, LLC is here to provide steadfast support through every stage of the estate planning process, delivering personable services to enhance your life. Contact us today to see how we can help!